List of activities related to molluscs & oceans for K-12. This site is about Biology and Environment education and issues related to Sciences in general and biology in particular. The May-June 2010 issue of Teacher Plus (www.teacherplus.org) is a thematic one – a biology special issue. Along with ideas for activities on different biological concepts for your classes, the issue also provides information on biodiversity related matters. Read it to get ideas on how biology can be taught differently; how teachers, students and school can contribute to conservation of Biodiversity. Teacher Plus also carries my column where every alternate month I write about diverse organisms and how they can be be part of a biology lessons. Biology is not about information – it is about gleaning knowledge and values to chart your course towards wisdom. 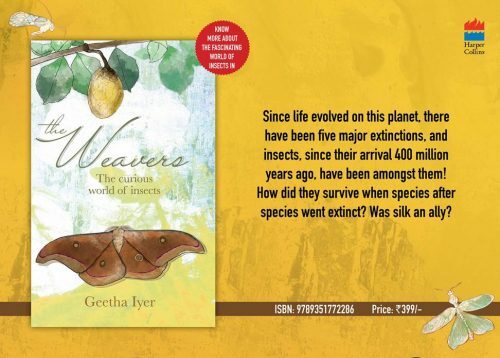 ​Happy to share with you the release of my second book on insects titled, “The Weavers-The Curious world of Insects.” Published by Haper Collins India Ltd, it is available both in print and kindle on Amazon.com; and at all leading bookstores . Its not a field guide but a book about Insects and their various quaint behavior. Their silk (especially silk woven by lesser known moths and other insects)is the central motif that strings together the stories about insects. It also has photographs of 121 insects from different orders.